The product has no duration set. In this case, you can add a duration to the product as shown in Selling Time-limited Memberships. This will not affect existing memberships and will take effect from the next order placed for the product. The system will not remove a customer from a group if the account has another valid membership for the group in place. This is correct and not an issue. Install WP Crontrol and check under Tools > Cron Events or under Settings > Cron Schedules if there are any indications of issues shown. Please note that the indicator WordPress cron found under WooCommerce > Status > WordPress environment does not guarantee that scheduled tasks are working correctly, as it merely reflects whether the constant DISABLE_WP_CRON is used or not. On low traffic sites or staging sites, scheduled tasks (cron) are only triggered sporadically. Consider enabling scheduled tasks at the system level – see Hooking WP-Cron Into the System Task Scheduler on how to achieve this. Access to your site is protected by password on the server level and scheduled tasks (cron) fail to execute due to lack of permission when the server receives the wp-cron request. Remove the password protection during tests or trigger cron events manually using WP Crontrol. Errors in third-party plugins, themes or customizations cause issues during processing and thus the membership handler cannot successfully process jobs. Disable plugins that are up-to-date but create issues. Update plugins that have not been updated in a while. Fix errors in customizations. Switch to a theme that is error-free. Plugins, themes and customizations should not produce any entries in the debug log. If they do, consider alternatives or fixing them. When a subscription is cancelled it does not imply that the user should automatically be removed from a group. The user should remain in the group during the time covered by the last payment. Example: I sign up and pay $15 for a month premium membership, right after that I cancel my subscription. I have still paid for a full month and should have premium access during that time. Once the month is over, my premium membership will end automatically. Note that this applies when Groups WooCommerce is used together with WooCommerce Subscriptions. If only Groups WooCommerce is used and time-limited memberships are sold, these are synchronized with the order status directly, i.e. when an order with a time-limited membership is cancelled or refunded, the membership ends immediately. This requires the WPML Translation Management plugin. Go to WPML > Settings > Multilingual Content Setup. 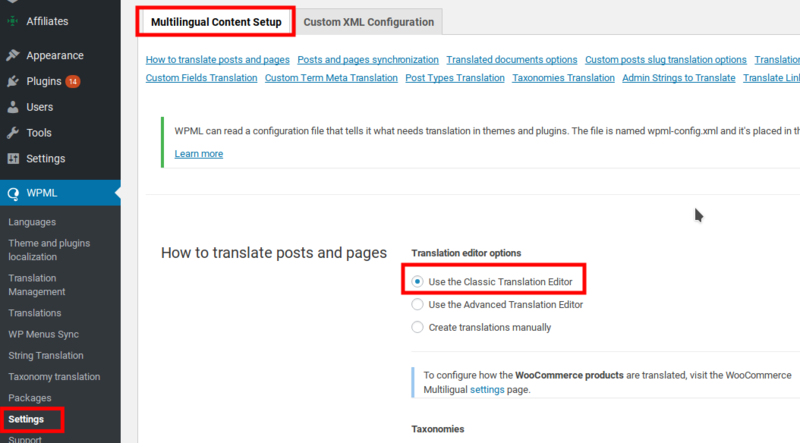 Under How to translate posts and pages choose Use the Classic Translation Editor. This will switch your product editor to the default view. Each product translation can then be edited using the normal editor, where you can manage which group(s) the user will be added to after buying the product as usual. This will log any PHP notices, warnings and errors to the log file along with information about membership events. The log file typically resides in wp-content/debug.log. Memberships do not end, time-limited Memberships are not terminated at all or end later than expected. Why? The customer has another valid order that grants access. Why isn’t the user removed from a group when a subscription is cancelled? How do you assign groups to products translated with WPML? How do you enable extension-specific debugging?